Magnemite in game: 7,955 Who? Important notice! Pokemon Magnemite is a fictional character of humans. Magnemite (Japanese: コイル Coil) is a dual-type Electric/Steel Pokémon introduced in Generation I. Prior to Generation II, it was a pure Electric-type Pokémon. It evolves into Magneton starting at level 30, which evolves into Magnezone when leveled up in a special magnetic field. Magnemite is a seemingly robotic life form that has a gray, spherical metal body with horseshoe magnets on each side and a single, large eye. It has three Phillips head screws on its body: two near the bottom of its body, and the other on top of its head and looks similar to an antenna. The two bottom screws serve no noticeable purpose, although they may be its feet as the Pokédex identifies a footprint similar to that of the screw's head. Even though Magnemite and its evolved forms are mechanical creatures, the anime has shown that it has emotions and a way of reproducing. It has even exhibited the need to eat, although its main form of nutrients is electrical currents. It is commonly found in locations such as power plants or caves with a strong magnetic field. Despite its modern, artificial appearance, Magnemite has been depicted in carvings discovered at the Ruins of Alph, and has been present in AZ's retelling of the Kalos war, indicating it has existed for at least 3,000 years. The magnetic units on Magnemite's body compose electromagnetic waves that allow it to defy gravity and can potentially disrupt electrical equipment. Magnemite is not known to be unnecessarily aggressive, but may approach Trainers with little notice. It can be attracted to anything emitting electricity or a magnetic field, including gadgets such as a Pokétch. It has even been shown to be attracted to electric Pokémon producing such fields. In the care of a Trainer, it can be a devoted fighter. However, it has been demonstrated that it may be deterred unless a strong bond is formed with its Trainer. If a wild Magnemite is approached, it may simply flee on rare occasions, as Magnemite do not care for interaction. However, if attacked, it will start retaliation with non-damaging moves. Magnemite first appeared in Sparks Fly for Magnemite. Ash and his friends were in Gringey City while the power went out. When they were looking around for the cause of the power outage, a lone Magnemite showed up and was feeling attracted to Ash's Pikachu, who had a cold. When a group of Grimer and its Muk leader were chasing Ash and his friends, a group of Magnemite and Magneton helped to fight them off. In Get Along, Little Pokémon, Ash, Misty and Tracey met a man named Ethan who used Magnemite to harness electrical energy from bolts of lightning during thunderstorms and then the electrical energy would be given to towns that were without power. Magnemite #6 evolved into a Magneton to save Ash and Pikachu from Team Rocket. A Magnemite belonging to the Olivine City Gym Leader, Jasmine, makes its debut in Fight for the Light! riding on Jasmine's shoulder through the whole episode. It is later used in her Gym Battle with Ash in Nerves of Steelix!, sending it out against Ash's Pikachu. Ash has battled another Gym Leader with Magnemite: Wattson in Watt's with Wattson?. Many wild Magnemite also appeared later on in the episode. A Magnemite appeared in PK13, in which it attacked Meowth and Wobbuffet with Thunder Wave, but it was quickly defeated by Wobbuffet's Counter. An army of Magnemite and Magneton, led by a Magnezone, appeared in Giratina and the Sky Warrior under the ownership of the main villain, Zero. They were used by Zero as a swarm to trap or capture, as well as being able to contain people and Pokémon by linking together around them, preventing them from moving. Brock temporarily trained a Magnemite belonging to the Pokémon Summer Academy in Camping It Up!. Unlike the rest of the group, Brock had no problems bonding with and educating his Pokémon. A wild Magnemite made an appearance in Expedition to Onix Island!, when it attacked Iris and Axew with an electric attack. Clemont owns a Magnemite that appeared in Clemont's Got a Secret!. It stays at the Lumiose City Gym. Two Magnemite appeared in Lights, Camera, Quack-tion, acting as lighting technicians for the film "Pokémon in Love". Four Magnemite were among the Pokémon controlled by Cassidy and Butch in Pikachu Re-Volts. Multiple Magnemite also appeared in The Power of One. Three Magnemite belonging to a group of Phony Pokémon interpreters appeared in The Poké Spokesman where they were convinced by Simon to cease their attacks. A group of Magnemite and a Magneton appeared as security guards in Current Events as they first attacked Team Rocket who sneaked into a power station guarded entirely by Pokémon. 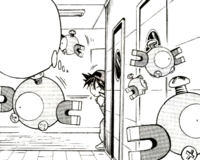 Ash saw the door had been opened by someone, and upon investigation, was also attacked by the Magnemite. Several Magnemite were among the Electric Pokémon that were lured by the "Miracle Crystal" that Attila and Hun were using in The Legend of Thunder!. Magnemite is one of the Electric-type Pokémon that was seen in the lake with crystal in As Clear As Crystal. Some Magnemite, their evolved form Magneton, a Steelix, and a Skarmory appeared in All Torkoal, No Play!. A Magnemite appeared in A Fan with a Plan! under the ownership of a Pokémon Coordinator competing in the Rubello Contest. A Magnemite was partnered with two Team Rocket trainees in Training Daze. A Magnemite appeared in the opening of Lucario and the Mystery of Mew. A group of Magnemite also appeared in Steeling Peace of Mind! and Saving the World From Ruins! along with numerous other Steel-type Pokémon (including some Magneton) on Iron Island. A group of Magnemite served as guards for the Valley Windworks in Gone With the Windworks!. A Magnemite belonging to Professor Kodama appeared in Sticking With Who You Know!. A Magnemite appeared in Dawn of a Royal Day! under the ownership of a Pokémon Coordinator competing in the Arrowroot Contest. A Magnemite belonging to a Team Plasma Grunt appeared in Team Plasma's Pokémon Power Plot!, Meowth, Colress and Team Rivalry! and Ash and N: A Clash of Ideals!. Two Magnemite appeared in Kalos, Where Dreams and Adventures Begin!, including one of them wearing a pink ribbon. A Magnemite appeared in Summer of Discovery! on a video icon. A Magnemite appeared in A Campus Reunion!. Multiple Magnemite appeared in The Future Is Now, Thanks to Determination!. A Magnemite appeared in Lights! Camera! Pika!, under the ownership of Frank. Four Trainers' Magnemite appeared in SM006. EP030 Magnemite Ash's Pokédex Magnemite, a Magnet Pokémon. Its means of floating through the air are not understood. This very mysterious Pokémon is of the Electric type. EP101 Magnemite Ash's Pokédex Magnemite, the Magnet Pokémon. It's able to float through the air and leave its Thunder Wave through its magnet shaped units located on its sides. A Magnemite appeared in File 3: Giovanni imprisoned at the Rocket Hideout. A Magnemite under the ownership of an International Police SWAT team member appeared in The Chase. A Magnemite made an appearance in The Lake of Rage under the ownership of a Team Rocket Grunt. Another Magnemite appeared during a flashback in The Redemption as one of the many Pokémon fighting in the great war of Kalos, 3000 years previously. Magnemite made their debut aboard the S.S. Anne in Danger: High Voltorb as many of the Pokémon ready to attack Red; however, it's not clear if they belong to Lt. Surge or to his Sailor. They appeared later in Buzz Off, Electabuzz!, searching the ship for Red. A Magnemite under the ownership of a Team Rocket Grunt appeared in Holy Moltres where it was used to battle Blaine's Arcanine and Rapidash. Lt. Surge used two Magnemite to act as chains to trap Red so he could attack him in Go for the Golbat. In Lapras Lazily, a wild Magnemite appeared in the abandoned Power Plant in Blue's flashback of how he met Agatha. Later, in Electro Magneton, three wild Magnemite and a Magneton attacked Blue and Evan. After Blue's Machamp defeated the Magneton, the wild Magnemite escaped. Lt. Surge used a Magnemite to get Morty's attention so he could help locate Gold and Silver in Hello, Lickitung. Later, in Magnificent Magnemite, Lt. Surge used a Magnemite to fight Morty's Misdreavus, using electromagnetism to shield attacks as well as to fire Zap Cannon. The fight, however, ended in a draw due to Misdreavus using Destiny Bond. Another Magnemite appeared in The Last Battle XIII as one of the Pokémon sent to help the fight in Ilex Forest. Wattson's two Magnemite were first seen with his Electrike battling Pokémon belonging to certain children. In Pangoro Poses a Problem, multiple Magnemite were among the Electric-type Pokémon that charged the Prism Tower during a blackout. Green caught a Magnemite before participating in the sports meet in Pokémon Sports Meet!!. Giovanni sent out Magnemite in an attempt to battle Squirtle in Squirtle, the Crybaby Pokémon. Black owns a Magnemite in The Golden Boys manga. Magnemite appears in the background of the Prism Tower stage in the 3DS version of the game. Instantly recognizable by the horseshoe magnets on either side of its body, this Magnet Pokémon uses electromagnetic waves to nullify gravity and float in midair. The sense of nostalgia it inspires has only been strengthened by the many years that have passed since its debut in the very first Pokémon games. Pokémon Mystery Dungeon: A group of Magnemite are the clients of the game's second mission, sending the player to save their friend who is trapped in Thunderwave Cave. One of the Magnemite decides to join the rescue team a couple of days later. Pokémon Mystery Dungeon: Explorers of Time and Explorers of Darkness: Two Magnemite serve as Magnezone's police units. Uses anti-gravity to stay suspended. Appears without warning and uses Thunder Wave and similar moves. It is born with the ability to defy gravity. It floats in air on powerful electromagnetic waves. Appears as if out of nowhere. It floats using anti-gravity and discharges electricity from two side-mounted units. It is attracted by electromagnetic waves. It may approach trainers if they are using their Pokégear. The units at the sides of its body generate anti-gravity energy to keep it aloft in the air. The electricity emitted by the units on each side of its body cause it to become a strong magnet. Magnemite attaches itself to power lines to feed on electricity. If your house has a power outage, check your circuit breakers. You may find a large number of this Pokémon clinging to the breaker box. 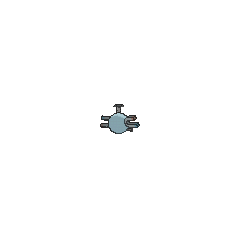 Magnemite floats in the air by emitting electromagnetic waves from the units at its sides. These waves block gravity. This Pokémon becomes incapable of flight if its internal electrical supply is depleted. The units at its sides are extremely powerful magnets. They generate enough magnetism to draw in iron objects from over 300 feet away. It moves while constantly hovering. It discharges Thunder Wave and so on from the units at its sides. Uses antigravity to stay suspended. Appears without warning and uses Thunder Wave and similar moves. The faster the units at its sides rotate, the greater the magnetic force they generate. The units at the sides of its body generate antigravity energy to keep it aloft in the air. The electromagnetic waves emitted by the units at the sides of its head expel antigravity, which allows it to float. They gather in places where electricity is available. They can be found clinging to the steel towers used to support power lines. It sends out electromagnetic waves, which let it float through the air. Touching it while it's eating electricity will give you a full-body shock. Moves marked with a superscript game abbreviation can only be bred onto Magnemite in that game. Magnemite looses electricity to attack. It can also recharge your Styler. It attacks by sending out bolts of electricity. Magnemite came out of crates in the Cavern Zone. What do they like best? Rhyperior's Bumper Burn and Rotom's Spooky Shoot-'em-Up! 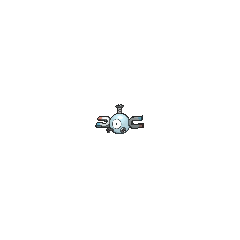 For other sprites and images, please see Magnemite images on the Bulbagarden Archives. In the Pokémon Red and Blue beta, Magnemite was originally known as "Coil", from its Japanese name. 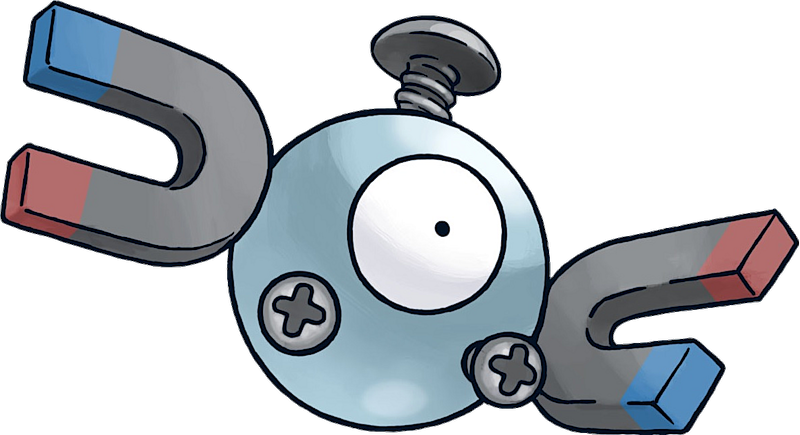 Magnemite, along with its evolution Magneton, were pure Electric-type Pokémon in Generation I, but became dual-type Electric/Steel in Generation II. This makes them the first Pokémon to ever change typing. Magnemite is the first Steel-type Pokémon in National Pokédex order. Despite most of Magnemite's Pokédex entries saying they are able to float through the air by employing powerful electromagnetic waves or even anti-gravity, Magnemite does not have the Ability Levitate, so it is still affected by Ground-type moves. However, starting in Generation IV, Magnemite can learn Magnet Rise, which simulates Levitate for five turns. 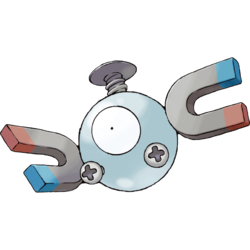 Magnemite, along with Magneton, has appeared in every regional Pokédex. This is due to the Sinnoh Pokédex's expansion in Platinum and the Unova Pokédex's expansion in Black 2 and White 2. Magnemite and its evolution Magneton are two of the few Pokémon that had their cry changed slightly in Generation III. This was due to Generation III utilizing a better sound effects game engine and newer game system. Pokémon Snap is the only form of a Pokémon canon that shows two Magnemite bonding, similar to a Magneton. However, when a picture is taken, they are still called Magnemite. Pokémon Mystery Dungeon: Red Rescue Team and Blue Rescue Team also showed this, but it was stated to be a failed evolution, due to the lack of a third Magnemite. In Generation V, Magnemite was the most traded Pokémon on the GTS. This is probably due to what is known as the Magnemite chain/coil: a scheme by which players could increase the number of visitors to their Join Avenue in Black 2 and White 2 by trading Magnemite on the GTS. The scheme originated with Japanese players and became popular worldwide. Magnemite seems to be based on a magnet. It may also be based on the objectification of electromagnetism, one of the four fundamental interactions of nature. Magnemite may be a play on magnetite. It may also be a combination of magnet or magnetite and mite, referring to its small size. Coil is literally coil, perhaps referring to the fact that a coil with electric current generates a magnetic field. Cantonese Chinese 小磁怪 Síuchìhgwaai Literally "Little magnetic monster"
Mandarin Chinese 小磁怪 Xiǎocíguài Literally "Little magnetic monster"